"The North Carolina Dept.of Social Services have violated my right. I have been violated." A DSS abhorrent caseworker took my baby, while filing a false allegation against me, while i was giving birth at the hospital." My child was taken from me premise on a false allegation by a caseworker, premised on a lie told my ex boyfriend/fiancee/spouse,and or a troubled dysfunctional "family" member." No lawyer however will sue for me. 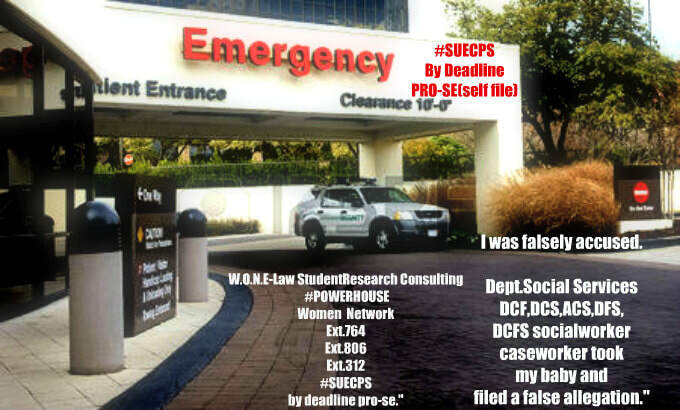 I am ready to sue by deadline pro-se self file, to hold caseworker accountable,before i lose my chance to exercise my right to sue for civil right damages for the harm i've suffered as my entire family." I am ready to sue per dss worker violating my rights,and the rights of my family." (Click here) prior to calling our e-staff to fill out required-staff-help form.